Back in 2009 the EU Commission set out regulations to phase out the use of inefficient incandescent light bulbs. The planned phase out took place over a number of years between 2009 and 2012, starting with the ban of 100W, then 60W and finally 40W bulbs. While we could all appreciate the intentions of the regulation to encourage the use of more energy efficient bulbs, a loophole meant that incandescent bulbs labelled as ‘rough service’ could continue to be sold. Now the EU Commission has created a new regulation (EU 2015/1428 for those of you who want to look it up) which closes the loophole and better classifies incandescent bulbs used for special applications. Incandescent decorative bulbs with coloured glass. The coloured or tinted glass indicates it is used for decorative purposes so will still be allowed. This includes those with squirrel cage or spiral filaments. Back in 2009 when the first ban came in to effect LED replacements were expensive and in some cases not quite up to scratch. Thankfully LED technology has advanced and we’re confident that you’ll now be able to get a direct replacement at a competitive price. The regulations will be applicable from 24th February 2016 so after this point we will no longer be able to source rough service bulbs banned by the regulation. We will continue to sell any stock held but it will be a case of once it’s gone, it’s gone. In response we will ensure that LED replacements for any bulbs are available through our website and wholesale business. If you’re uncertain which bulb is a compatible replacement then please contact our sales team on 01494 880099. 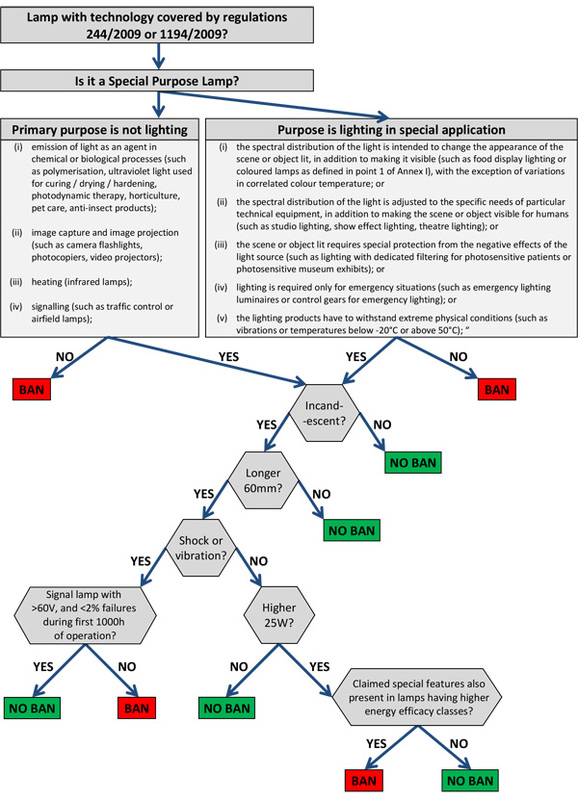 The lighting industry organisation, Lighting Europe, have produced a flow chart to identify those lamps affected by the ban.